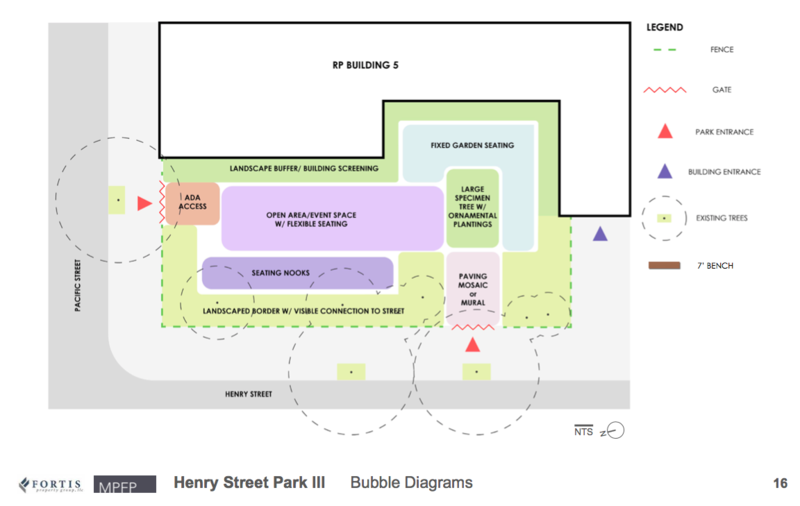 COBBLE HILL – Representatives for Fortis and MPFP Landscape Architecture & Urban Design presented the most recent plans for Henry Street Park III Wednesday evening at the Brooklyn Community Board 6 Parks Committee meeting. Located on Henry Street (on the corner of Pacific), the passive green space is part of Fortis’ seven-building River Park redevelopment project to convert several former Long Island College Hospital sites into luxury residences. The park is currently closed during the construction of Fortis’ 14-story 5 River Park condo building at 347 Henry Street. 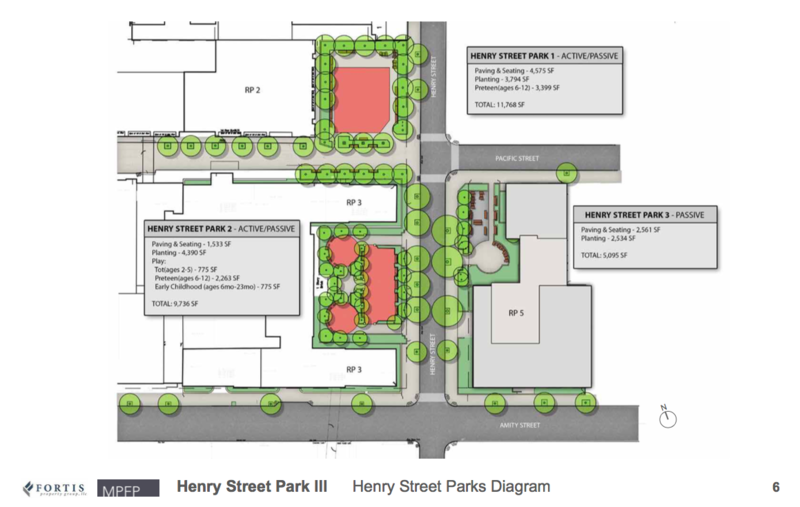 Parisi presented two design options for Henry Street Park III, a more traditional linear option, and a more playful, curvilinear option. The meeting attendees preferred the second softer design. Both designs include pushing the surrounding fence further out toward the public area/sidewalk; planting a landscaped border with visible connections to the street and to Henry Street Parks I and II; and removing the steps from the Pacific Street entrance and adding an ADA accessible ramp. Several meeting attendees were in favor of the city’s Parks Without Borders initiative—which makes parks more accessible and welcoming—and said they’d like to see the gates and fence surrounding Henry Street Park III removed. “There was quite an outcry to remove the fence, but we know that in any of these parks that a fence is more of a safety measure” to prevent children from running out onto the street, Parisi explained, adding that a fence will likely remain in the plans. 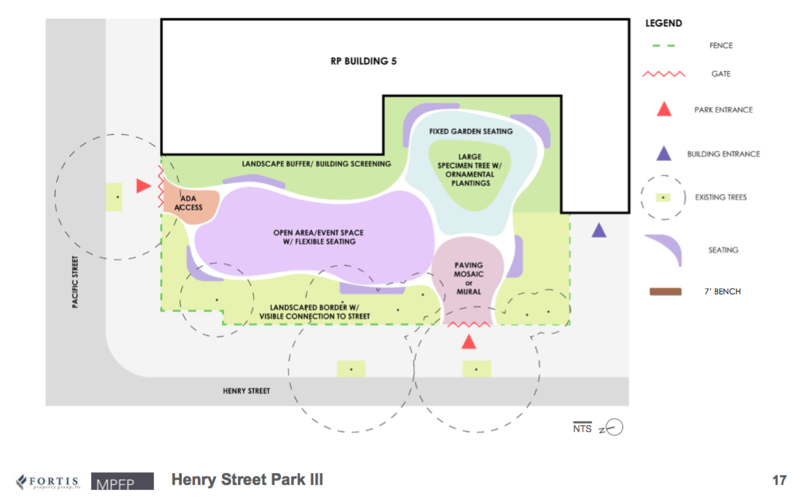 The two designs presented on Wednesday also feature a central open area/event space; a drinking fountain; seating nooks; a mosaic honoring the site’s history at the Henry Street entrance; and a fixed seating garden area in the park’s southeast corner. “We heard a lot about the chess tables,” said Parisi. “There was a number of people that said we don’t want the chess tables at all. Some people said if they remained that they should be nicer….” The new park plan includes fewer chess tables. When questioned about the amount of sunlight the park will receive, Parisi said that a shade study was conducted for the whole block, reviewing each season three times a day, but the results were not available to share at last night’s meeting. “We can look into trying to provide that when we come back,” he said. Other concerns the community asked the design team to consider included: ensuring that the park lighting does not flood into the windows of neighboring homes; planting native trees and greenery that support birds and insects; and adding trees that do not damage the sidewalks. Another meeting attendee suggested designating a place in the park to honor Donald and Mildred Othmer who bequeathed Long Island College Hospital $160 million. “We will work over the coming months with the Department of Parks to continue to refine the plan and then we hope to be back to you in May or June…so we can present a vision for the park in its close-to-final stages for additional feedback from all of you,” said Fontas. He added that the team expects to be able to begin work in the park by Fall 2019. 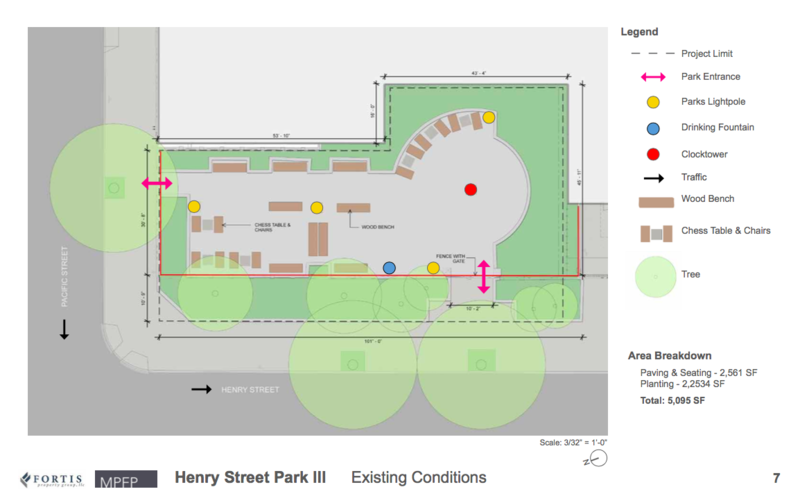 Click here to see the Henry Street Park III March 20, 2019 presentation.